Cytomegalovirus (CMV) is a member of the Herpesviridae family, along with herpes simplex viruses 1 and 2, Epstein-Barr virus, and varicella-zoster virus. It is a double-stranded DNA virus with a protein coat and lipoprotein envelope. Similar to other herpesviruses, CMV is icosahedral and replicates in the host's nucleus. Replication in the host cell typically manifests pathologically with large intranuclear inclusion bodies and smaller cytoplasmic inclusions, and is accompanied by the presence of CMV viral particles in the plasma. See the images below. 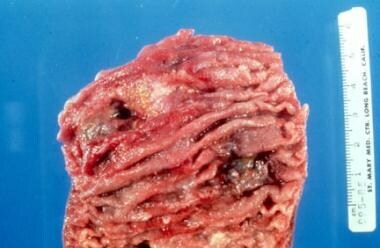 Gross specimen of bowel showing ulceration secondary to cytomegalovirus colitis. Giant cell with inclusion body characteristic of cytomegalovirus colitis. Between 50% and 80% of the world's population is seropositive for CMV. The initial CMV infection in the immunocompetent host typically is mild and goes undetected clinically. This is followed by a chronic latent state, during which the virus remains present within the host cells, but viral proliferation is prevented by the host cell-mediated immunity. Failure of immune containment may lead to reactivation with viral proliferation and severe systemic illness. Systemic CMV disease is characterized by fever, pancytopenia, and inflammatory changes in multiple organs including the liver and lungs, and in the retina. Colitis is a frequent manifestation of this acute systemic illness. Patients are rendered susceptible to systemic CMV disease by treatment with immunosuppressive medications, or by illnesses that reduce cellular immunity, such as human immunodeficiency virus (HIV) infection. Acute systemic illness caused by CMV is particularly common following initial exposure in an immune compromised individual (in particular, in a CMV-negative transplant recipient who receives an organ from a CMV-positive donor). Cytomegalovirus (CMV) has 3 major patterns of infection. The first is primary infection, in which a patient who has never been exposed to the pathogen becomes infected, either by contact with another patient who is actively infected or by transfer of blood or tissue from a seropositive individual with latent virus. The second pattern, reactivation, occurs in a patient who is seropositive with a latent virus when the host's immune system becomes compromised. The third, superinfection, occurs when a patient who is CMV-seropositive receives latently infected cells from another patient who is seropositive. The resulting CMV infection is from the latent donor cells, not from the recipient cells. Regardless of the pattern of infection, resolution of an active infection results in a latent state in which CMV persists indefinitely in the host tissues. Viral proliferation is absent, and viral antigen and DNA are undetectable in plasma. If the host's T-cell response becomes compromised by disease or by immunosuppressive therapy, latent virus reactivation can occur. CMV infection can cause a variety of syndromes. Most primary infections in immunocompetent individuals go undetected. Nonspecific fever, sometimes accompanied by pancytopenia, characterizes uncomplicated CMV infection. Severe cases of tissue-invasive CMV disease may produce a bewildering array of clinical syndromes, depending on the particular organs involved. When the colon becomes affected by tissue-invasive CMV, ulcerative changes can be seen. As the body mounts an inflammatory response, watery diarrhea may begin to develop. As ulcers increase in depth, erosion into blood vessels can cause profuse bloody diarrhea. Over time, inflammatory polyps may develop, which, rarely, may obstruct the colon. Severe inflammation and vasculitis may lead to ischemia and transmural necrosis of the bowel, resulting in perforation and peritonitis. No racial or sexual predilection has been& recognized. Reports of patients who are not immunocompromised contracting CMV colitis indicate that the illness tends to occur in patients older than 70 years. In immunocompromised patients, CMV can occur at any age, including the newborn period. With rapid diagnosis and proper antiviral therapy, the prognosis of patients with cytomegalovirus (CMV) colitis is good if the underlying disease itself is controllable. In patients without immunocompromised status, the prognosis appears to be age dependent, with patients older than 55 years having a higher mortality. Males and patients who need surgery also have a poorer prognosis. Since the introduction of effective antiviral agents, morbidity and mortality have been reduced. Toxic megacolon and necrotizing colitis: Once diagnosed, patients with these complications usually have diffuse disease and a poor prognosis. In these patients, generous resection of all the affected colon is indicated to avert perforation and sepsis. Maconi G, Colombo E, Zerbi P, et al. Prevalence, detection rate and outcome of cytomegalovirus infection in ulcerative colitis patients requiring colonic resection. Dig Liver Dis. 2005 Jun. 37(6):418-23. [Medline]. Kim YS, Kim YH, Kim JS, et al, for the IBD Study Group of the Korean Association for the Study of Intestinal Diseases(KASID), Korea. Cytomegalovirus infection in patients with new onset ulcerative colitis: a prospective study. Hepatogastroenterology. 2012 Jun. 59(116):1098-101. [Medline]. Gronborg HL, Jespersen S, Honge BL, Jensen-Fangel S, Wejse C. Review of cytomegalovirus coinfection in HIV-infected individuals in Africa. Rev Med Virol. 2017 Jan. 27(1):[Medline]. Sager K, Alam S, Bond A, Chinnappan L, Probert CS. Review article: cytomegalovirus and inflammatory bowel disease. Aliment Pharmacol Ther. 2015 Apr. 41(8):725-33. [Medline]. Beswick L, Ye B, van Langenberg DR. Toward an algorithm for the diagnosis and management of CMV in ptients with colitis. Inflamm Bowel Dis. 2016 Dec. 22(12):2966-76. [Medline]. Onyeagocha C, Hossain MS, Kumar A, et al. Latent cytomegalovirus infection exacerbates experimental colitis. Am J Pathol. 2009 Nov. 175(5):2034-42. [Medline]. [Full Text]. Al-Zafiri R, Gologan A, Galiatsatos P, Szilagyi A. Cytomegalovirus complicating inflammatory bowel disease: a 10-year experience in a community-based, university-affiliated hospital. Gastroenterol Hepatol (N Y). 2012 Apr. 8(4):230-9. [Medline]. [Full Text]. Pillet S, Pozzetto B, Jarlot C, Paul S, Roblin X. Management of cytomegalovirus infection in inflammatory bowel diseases. Dig Liver Dis. 2012 Jul. 44(7):541-8. [Medline]. Chan KS, Lee WY, Yu WL. Coexisting cytomegalovirus infection in immunocompetent patients with Clostridium difficile colitis. J Microbiol Immunol Infect. 2016 Dec. 49(6):829-36. [Medline]. Lancini D, Faddy HM, Flower R, Hogan C. Cytomegalovirus disease in immunocompetent adults. Med J Aust. 2014 Nov 17. 201(10):578-80. [Medline]. Goodman AL, Murray CD, Watkins J, Griffiths PD, Webster DP. CMV in the gut: a critical review of CMV detection in the immunocompetent host with colitis. Eur J Clin Microbiol Infect Dis. 2015 Jan. 34(1):13-8. [Medline]. Kim JW, Boo SJ, Ye BD, et al. Clinical utility of cytomegalovirus antigenemia assay and blood cytomegalovirus DNA PCR for cytomegaloviral colitis patients with moderate to severe ulcerative colitis. J Crohns Colitis. 2014 Jul. 8(7):693-701. [Medline]. Jones A, McCurdy JD, Loftus EV Jr, et al. Effects of antiviral therapy for patients with inflammatory bowel disease and a positive intestinal biopsy for cytomegalovirus. Clin Gastroenterol Hepatol. 2015 May. 13(5):949-55. [Medline]. Shukla T, Singh S, Loftus EV Jr, Bruining DH, McCurdy JD. Antiviral therapy in steroid-refractory ulcerative colitis with cytomegalovirus: systematic review and meta-analysis. Inflamm Bowel Dis. 2015 Nov. 21(11):2718-25. [Medline]. Maconi G, Lombardini M, Furfaro F, et al. Long-term outcome of inflammatory bowel diseases with cytomegalovirus colitis: effect of antiviral treatment. Eur J Gastroenterol Hepatol. 2014 Oct. 26(10):1146-51. [Medline]. Chan KS, Yang CC, Chen CM, et al. Cytomegalovirus colitis in intensive care unit patients: difficulties in clinical diagnosis. J Crit Care. 2014 Jun. 29(3):474.e1-6. [Medline]. Yadegarynia D, Tehrani S, Roohi M, et al. Prevalence of cytomegalovirus infection in patients with ulcerative colitis: a prospective cross-sectional study in Tehran, Iran. Iran J Microbiol. 2018 Oct. 10(5):342-7. [Medline]. [Full Text]. 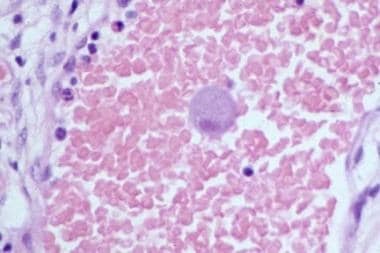 Carpani G, Foresti S, Dell'Oro R, Grassi G, Bombelli M. Severe systemic cytomegalovirus infection in an immunocompetent patient outside the intensive care unit: a case report. BMC Infect Dis. 2019 Jan 9. 19(1):34. [Medline]. [Full Text]. Disclosure: Received grant/research funds from Novartis for other; Received grant/research funds from Bayer for other; Received grant/research funds from Otsuka for none; Received grant/research funds from Bristol Myers Squibb for other; Received none from Scynexis for none; Received grant/research funds from Salix for other; Received grant/research funds from MannKind for other. The authors and editors of Medscape Drugs & Diseases gratefully acknowledge the contributions of previous authors Deron J. Tessier, MD, and Russell A. Williams, MBBS, to the development and writing of this article. Fast Five Quiz: How Much Do You Know About Ulcerative Colitis? Fast Five Quiz: Can You Properly Identify Ulcerative Colitis and Initiate Best Treatment?